Local Authorities in Scotland are not having an easy time of it. The cuts being handed down from Westminster are having a dire impact on not only local authorities and their staff, but also on services and the communities that they were set up to support. Our annual funding survey of the network of 36 Women’s Aid groups in Scotland showed that 97% of respondents received budget cuts or standstill local authority funding in 2015/16. This means that each of these groups faced real terms cuts last year, with no uplift cover increased energy, transport, VAT and other operational costs. We know that the impact and costs associated with domestic abuse are enormous, and that we can only tackle this problem if local authorities and specialist service providers work together in partnership. But working in partnership requires an understanding of the nature of domestic abuse. It requires an understanding of the scale of the problem, the impact that it has, and the needs of the women, children and young people affected by it. Working in partnership means working towards agreed and shared outcomes. In this complex funding environment, this is easier said than done, but it is possible. For those involved in commissioning processes – the activities involved in putting services in place – the terms ‘grants’, ‘service contracts’, ‘standing orders’, ‘competitive tendering’, ‘procurement’, ‘service level agreements’ and ‘coproduction’ will all be familiar. But familiarity does not always translate into understanding, and there has been much confusion across the UK, on the part of both local authorities and service providers, as to the routes that can be taken when commissioning services. In England, for example, there has been a shift towards competitive tendering for domestic abuse service contracts, with some local authorities claiming that this is the only option available. Just to be clear – it is not. Competitive tendering is a process by which service providers bid against one another for a service contract. Sounds okay in theory, especially when local authorities are now obliged to consider not just the contract cost, but the quality of the proposed service too. But when we look more closely at how these processes tend to play out, we see service providers undercutting one another, with larger generic organisations squeezing out smaller, specialist ones which have been set up to meet local need; we see existing services being forced to issue redundancies, freeze posts, and cut staff pay, terms and conditions; we see refuges closing, children’s services being slashed and reductions in support for those trying to rebuild their lives in the community; and we see the devastating impact that all of this has on workers and, most importantly, on the women, children and young people who are accessing their services. Competitive tendering has been described as a ‘race to the bottom’; it is decimating services and it is neither sustainable nor safe. Thankfully, in Scotland, the majority of local authorities realise this; they understand that the use of competitive tendering for domestic abuse service contracts is not appropriate and are taking strategic approaches to commissioning which are rooted in the needs and experiences of those affected by domestic abuse. This is not the time for local authorities to be rigid in how they fund services. It is a time to be innovative and creative, and to use the tools and approaches available to ensure that we can provide specialist services that meet the needs of the women, children and young people accessing them. 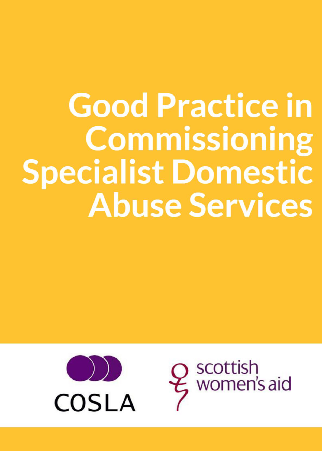 Today Scottish Women’s Aid, in partnership with COSLA, are launching a guidance document, Good Practice in Commissioning Specialist Domestic Abuse Services, for commissioners of specialist domestic abuse services. This guidance will support commissioners in Scotland to consider the nature of domestic abuse, the needs of the women, children and young people affected by it and the range of approaches that they can adopt in commissioning services that meet these needs. ‘The revolution will not be funded’, said INCITE!, the grassroots organisation working to end violence against women of colour. If local authorities listen to women, children and young people affected by domestic abuse, if they use what they hear to shape commissioning processes and, thereby, the services that they fund, then they may not be funding a revolution, but they will certainly be engaged in a revolutionary act. Orlaith McAree is the Service Development Officer at Scottish Women’s Aid. She works with our members on the development of services for women, children, and young people. She provides support for members in developing and sharing good practice, and in engaging with key stakeholders. She also promotes good practice amongst external agencies, ensuring that the needs, voice and rights of women, children and young people are heard, enacted and have an impact at both a local and a national level.